MOSCOW --- Russia is finalizing the trials of a sophisticated cruise missile designated as Kh-32 and intended to equip the Tupolev Tu-22M3 supersonic long-range bomber fleet, according to the Izvestia daily. The cutting-edge missile is virtually invulnerable to ground-based air defenses and interceptors of a potential adversary. Once launched, the product of the Raduga Design Bureau climbs to an altitude of 40 km, to the stratosphere, to dive on the target at a steep angle. A source in Russia’s defense industry has confirmed that the Kh-32 missile’s tests were in final stages, and the weapon itself was at a very high degree of product availability. The Tactical Missiles Corporation, Raduga’s parent company, has confirmed that the work on the latest product is under way, but declined to comment on its progress. According to expert Dmitry Kornev, the advanced cruise missile is designed, in the first place, to deal with enemy ships, radars and so-called radio-contrast targets, e.g. bridges, military bases, electric power plants, etc. After the launch by the Tu-22M3, the missile climbs to 40 km, transitions to level flight, approaches the target and dives toward it. Since the Kh-32 has an inertial navigation system and a radar homing head, its accuracy is independent of GPS/GLONASS navigation satellite updates. Presumably, the weapon has a range of 1,000 km and a speed of 5,000 km/h at the least. The combination of speed and flight path makes it virtually invulnerable to enemy surface-to-air missiles and fighter jets. 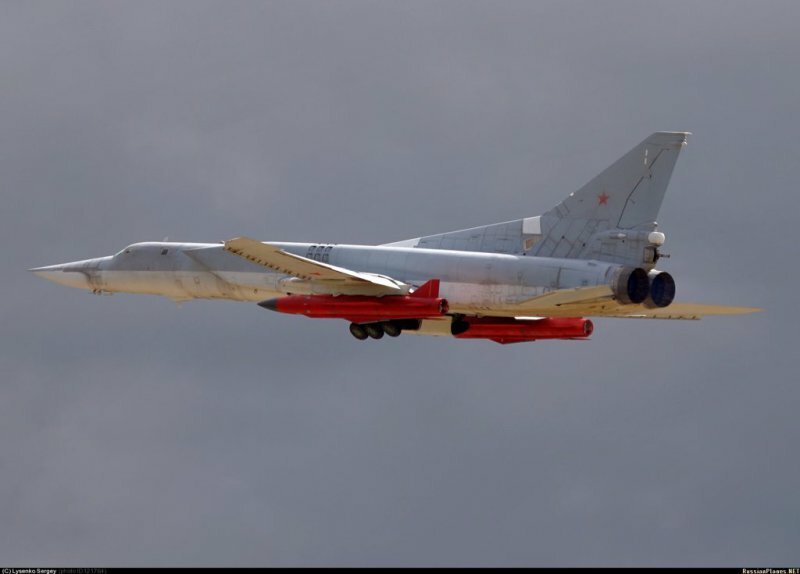 The new cruise missile is a derivative of the Kh-22 family that has been until recently the mainstay of the weapons suites of both the Tu-22M3 supersonic bombers and the older, now-decommissioned Tu-22M2s. The Soviet Navy alone has more than 10 Tu-22M3 regiments organized with five air divisions. The Soviet Air Force had about the same number of the bombers. Each regiment comprised 20 Tu-22Ms capable of hauling 40 or 60 Kh-22 missiles depending on the range to the target, according to Russian Navy historian Dmitry Boltenkov. A primary target for the Tu-22M3s were US Navy aircraft carrier strike groups. A salvo by a Tu-22M3 regiment would guarantee the elimination of the carrier itself and all of her escorts - cruisers, destroyers and guided missile frigates. The Kh-32’s development was kicked off in the early 1990s and its early launches are believed to have taken place in the mid-2000s. In summer 2013, pictures of a Tu-22M3 carrying Kh-32 mockups on experimental sorties were published. They were taken at the airfield of the Gromov Flight Research Institute in the town of Zhukovsky, according to the Izvestia daily.